Honey I’m Good-Andy Grammer | Wedding Wisdom, Etc. Go figure. A song about the virtues of fidelity! You know, that works at a wedding! It has a “feel-good, be-good” optimism — just look at the couples in the song’s video. 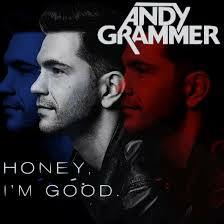 “Honey I’m Good” by Andy Grammer was released in 2014 and was an immediate hit. Ignore the fact that this song has an incredibly similar “feel” to the unfortunate novelty song “Cotton Eye Joe”. What separates the two songs is the cleverness of Andy Grammer’s lyrics. The story he told on “The Today Show” was that he had just gotten married, and was about to go on tour to support his new album. With all the temptations of women on the road, he composed the lyrics “I could have another but I probably should not, I got somebody at home.” The rest of the song is filled with similar reasons to say “no” to groupies on the road. So instead of being a dumb country “Cotton Eye Joe” rip-off, it’s an incredibly catchy anthem of remembering your marriage vows. The video itself, very subtly shows couple after couple holding up numbers, presumably representing the number of years they’ve been together as a couple, while singing along to the song. It works wonders on the dance floor. It’s a surefire winner for wedding crowds. Here are the lyrics. My baby’s already got all of my love. So nah nah honey, I’m good….. I love the a capella introduction with nothing but vocals and handclaps. For a simplistic :tongue-in-cheek “throwaway” song, it’s lasted quite nicely for the past three years, It’s a definite dance-floor filler. Check it out and leave me a comment.